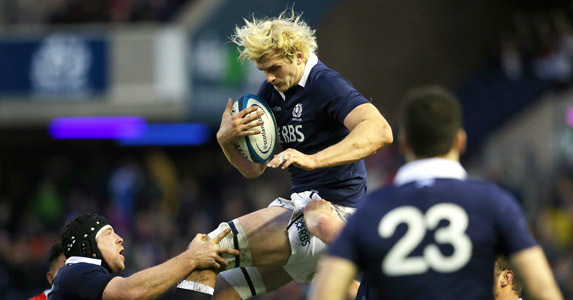 Looking for a partner: Will Richie Gray come in to replace Al Kellock for the game against South Africa this week? Scotland escaped from a bruising encounter with the Japanese last weekend and now look ahead to the visit of South Africa on Sunday. What did we learn? I have a suspicion Al Kellock’s presence in the starting line-up against Japan – which took many by surprise – was some sort of Scott Johnson smokescreen to keep the South Africans on their toes at set-piece time. It wouldn’t be a surprise if the excellent Tim Swinson found a new second row partner next weekend. Whether that is the combative Jim Hamilton (who partnered Swinson in the Nelspruit test in June) or Richie Gray (who was on Lions duty) remains to be seen. I’d go with Gray, and the noise when he came on against Japan suggests the fans would agree. With his own younger brother coming up fast on his shoulder, Gray needs to reaffirm his reputation as soon as possible. Arguments rage over the identity of our best outside centre, but at least until Alex Dunbar recovers from injury the 12 shirt should be firmly in Matt Scott’s grasp. Against Japan he often acted as a Kiwi-style second 5/8ths, interchanging with Ruaridh Jackson to great effect and keeping the defence guessing as to where the strike would come in to the line. His first properly great game for Scotland was against South Africa in the summer, where he led constant raids on the Springbok line and put in a towering defensive performance. Since then he has looked increasingly capable at club and international level. Although the South African team has changed/improved a lot since that game that Scotland so nearly pinched, like many of this team Scott will fancy another crack at them, this time on home turf. All of which makes news that he may have picked up a serious hand injury very sad indeed. If scans reveal he does require surgery a replacement will be required, and quickly. Duncan Taylor of Saracens is the only one left in the squad with any sort of form at 12, and who would partner him is open to debate. We didn’t learn whether Japan was indeed Nick De Luca’s last chance or not; he didn’t do anything vastly wrong but neither did he do anything that stood out much, save for one good break where the turf hampered his traditional sidestep. Are we really going to throw the precocious and dynamic young Mark Bennett in against South Africa in an untried combination? It’s the crazy sort of thing Scott Johnson might just go for. Scott Johnson has a real humdinger of a choice coming up in the back row. 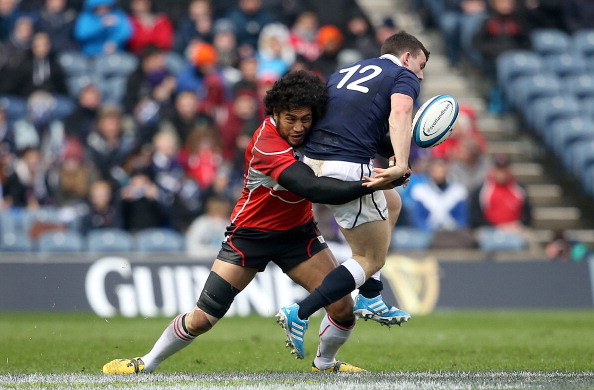 Al Strokosch is the enforcer and played his best game in a Scotland shirt against South Africa last time out. Dave Denton is the dynamic ball carrier who has rediscovered his form and gets the team going forward. Kelly Brown is the captain, playing out of position at 7 but doing an admirable job. Sadly, we’re going to need more than admirable against the Springboks. On the bench waits genuine openside John Barclay, who for twenty minutes tackled and slowed Japanese ball in exactly the manner you would want and has been in good form since moving to the Scarlets. There is a growing clamour for his inclusion, but who do you leave out? It looks like Strokosch would unfortunately be the one to make way, with Brown restored to his best position of 6. A back row of Brown, Barclay and Denton has balance and firepower. To divert from the future and reflect briefly, the last time Scotland played against Japan there was a record-breaking points haul. Japan today are not a team you put 100 points past. 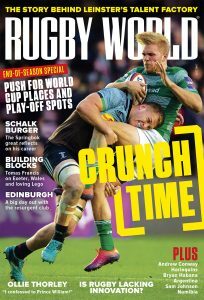 They are organised and physical, and while they lack composure at certain key moments, they have searing pace throughout the backline, good hands and play a joyous brand of direct, basic rugby. They really only have one mode: attack. If you are going to sell the game of rugby to people who tire of scrums and stoppages, Japan are an example of the good that still beats at the heart of our game. Brush up on concentration (and import a few bigger second rows) and this will be a formidable rugby nation. Unfortunately, lapses in concentration are still costing us soft tries. Sometimes the defence looks rock solid and well drilled. At other times it looks like a colander. This is not a flashy Scotland side and they are becoming more patient where before they would have desperately tried to force tries – and behold, the tries are coming. Luckily this helps keep the scoreboard going when the soft tries are being given away at the other end. When Scotland do play with intensity and tempo they can be very hard to handle. Sadly such consistency is rare, but luckily for Scotland fans who fear a mauling at the hands of the Springboks, they do tend to raise their game against better opposition.